Some people see numbers and letters as visions. Synesthesia is a real phenomenon. the perceptions are permanent: they begin at child age and don’t change throughout life. Researchers think the phenomenon might derive from child age. Babies are said to perceive the world like a Synesthete, with mixed senses, because their brains are not completely developed. Getting older, the senses are separated from each other. For some people the separation does not take place and therefore they stay Synesthetes their whole life. Synesthesia occurs eight times more often in women than in men, and also has a disproportionate occurrence in left handed people. 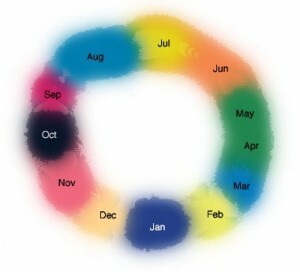 There are a lot of different types of Synesthesia, of which the connection between grapheme and color is the mostly distributed type, followed by the connection between time units and color and musical sounds and color. The most common form �called Grapheme-color synenesthesia � is where numbers or individual letters of the alphabet are shaded or tinged with a color, yet the color pattern is different for every individual. Many synaesthetes report that they were unaware their abilities were special or unusual until they realized other people didn’t have them. One such person recalls that to make an ‘R’ involved first writing a ‘P’ and then drawing a line down from its loop, and being surprised that this would turn a yellow letter into an orange letter, just by adding a line. In other cases, strings of numbers form a composite colour based on those of its individual characters – just like mixing paint and primary colours to get shades. Another story mentions a child saying the best candies were the “4′s and 5′s”, meaning the red and orange ones. I’ve heard about this before, think I read it somewhere about someone famous, just cant remember who it was. This would be such a cool ability to have.